When it comes to cars, Italy has a well-established pedigree. You may have heard of Fiat and Ferrari, but have you heard of Lancia? 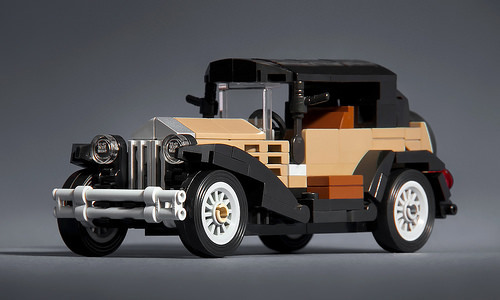 If not, let Lukasz Libuszewski educate you with his classy-looking 1922 Lancia Lambda. When it was introduced the Lambda was truly ahead of its time, in part because of its unibody construction and independent front suspension. Lukasz’s version is a marvel of minifigure-scale engineering, as he has managed to capture elegant curves and angles in such a small model. The stacked wedge plates make for excellent hood louvers (the slotted design that helps ventilate the engine), and the minifig hands make for nice side mirrors. Hop on in and drive away!